With more than 25 years’ experience behind it, Speedheat understands that every installation is different. That’s why, for your electric underfloor heating installation, we work in partnership with property owners, designers, flooring specialists and building experts to design and install a bespoke solution for every customer. Whether for a primary heating system or a single cold spot, in homes or businesses, under wood, carpet, rugs, vinyl or natural stone, a Speedheat electric underfloor heating installation is up to almost any challenge. 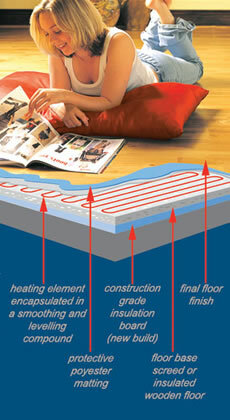 It is also the only electrical underfloor heating system in the UK recommended by leading flooring specialist, Amtico. From modern homes to historic buildings, with underfloor insulation and soundproofing, overcoming a damp problem or unusually shaped rooms, Speedheat has the solution. Simplicity of the electric underfloor heating installation directly under the final floor finish means no major upheaval and at just 1.5mm thick, there is no noticeable build up in floor height. With impressive response times – as little as 20 minutes before you feel comfortably warm – Speedheat is energy efficient and cost effective, with many customers reporting real savings on heating costs. And you get peace of mind, too, with Speedheat’s full 10-year warranty. Speedheat UK operates in a joint venture from the Speedheat manufacturing base in South Africa, where the system was developed in 1986 in collaboration with DuPont. The UK-wide Speedheat network ensures your electric underfloor heating installation will be quick, professional and fully guaranteed. Speedheat is an international brand and also has companies in South Africa, the Netherlands, France, Spain, Australia and the United States.